Happy Wednesday! Today's workout is one I made for teaching my first-ever Total Body Sculpt class at VENT Fitness this past Friday. People seemed to really enjoy it, and everyone worked up a sweat, so I thought I'd share it with you all, too! :) It's a longer workout than what I usually post here, which is another goal for the blog in its second year - longer workouts you can do in the gym or at home. For this one, all you need is a set of heavier weights and a set of light weights, and of course a water bottle, sweat towel, and exercise mat if you so desire. I'd recommend warming up by jogging in place for a few minutes and doing a few jumping jacks just to get the blood flowing and heart rate up a bit. After that, ready to get your whole body workin' today? Keep reading for the details! What You'll Do: start with #1 and go through each pair three times, each exercise lasting 1 minute, for a total of 6 minutes per pair. This workout will take about an hour after warm up, water breaks, and a cool down. Ready to get sweaty and work those muscles?! Military Presses (heavy weights) - start in a standing position with your elbows raised to shoulder height at a 90˚ angle holding weights in both hands above you. From here, press the weights up above you so they touch, and bring them back down to shoulder height. Mountain Climbers (no equipment) - start in a high plank position, shoulders over your wrists, and alternate running your feet and bringing your knees to your chest. Trainer Tip: if the running is too much, simply step your legs in to your chest one at a time. Hammer Curls (heavy weights) - like regular bicep curls, but turn your wrists so your palms face each other. From here, lift the weights up toward your shoulders keeping your elbows by your ribs the entire time. Remember to keep the motion slow (it's not a race! ), especially as you lower them back down. Weight Running (heavy weights) - start in a runner's stance, with your legs split, slight bend in the knees, and arms bent holding a weight in each hand. From here, swing your arms as if you're running, focusing on really driving forward and up with your elbows. Prone Tricep Pulses (light weights) - start lying on your stomach, arms straight back by your sides, a weight in each hand with your palms facing the ceiling. Keeping your arms straight, lift them up off the floor slightly, and pulse them in place for 1 minute. Feet to Hand Jumps (no equipment) - start in a high plank and jump your feet as close to your hands as you can get them, keeping your hands planted on the ground the whole time. Jump back into a plank position. Keep going for 1 minute. Trainer Tip: if the jump is too much, simply step your feet up and back. Weighted Side Lunges (heavy weights) - start standing with your hands by your sides holding a weight in each. Step out to one side and lunge down as deep as you can, keeping the other leg straight as you go down. Come back up to start and immediately step out into a side lunge on the other side. Keep alternating side lunges, focusing on keeping your chest up and feet facing forward. Skaters (no equipment) - think of these like what speed skaters do except instead of gliding on the ice, you're hopping side to side on the floor. Start standing and hop to one side bringing your other leg diagonally behind you. Touch that foot to the floor, and immediately hop to the other side. Keep alternating hops for 1 minute. Trainer Tip: if hopping is too much, just step out to the side instead. Side-Lying Abductor Raises (1 heavy weight) - lie down on one side, propped up on your elbow with your legs out straight, feet stacked. Hold the weight against your top leg between your hip and your knee. Keeping the weight there the entire time, lift that leg up as high as you can, then lower it back down. Keep lifting for 30 seconds on one leg, then 30 seconds on the other. Trainer Tip: the farther down your leg you hold the weight, the harder this move will be. So, closer to your hip = easier; closer to your knee = harder. Adjust as you need to. High Knees (no equipment) - from standing, alternate bringing your knees up to hip level, quickly jumping your feet. If you need to rest from the cardio, simply march in place bringing your knees up to hip height. Kneeling Leg Lifts (1 heavy weight) - start in an all-4's position with 1 heavy weight behind one knee. Squeeze your hamstrings so the weight stays in place, and lift and lower that leg. Try to get that thigh up to be parallel to the floor, and then tap your knee to the floor on the way down. Lift for 30 seconds on one leg, then switch to the other. Military Squats (no equipment) - start standing and jump your feet out like a jumping jack, but lower yourself down so your hands touch the floor. Jump straight back up to standing and immediately jump back down, using your glutes and quads to lower yourself. Keep your back straight and chest up as you jump. Trainer Tip: if the jumping is hard on your knees or ankles, simply step your feet out to the side and then lower yourself down. Side Plank Hip Dips (no equipment) - start out in a side plank on your elbow, either with your legs out straight and feet stacked (harder) or with one leg bent underneath you (easier). From here, lower your hips down to the floor and then raise them up as high as you can. Keep lifting and lowering your hips for 30 seconds each side. Fast Bicycles (no equipment) - like regular bicycles, but pedal your feet fast. Remember to focus on engaging your abs, and trying to get your shoulder blades up off the floor when you bring your elbow to meet your knee. Banana Rolls (no equipment) - start on your back, arms by your ears and legs out straight, hovering over the ground. Maintaining your arm and leg position throughout, hold that position for 10 seconds, then roll over onto your right side. Hold for 10 seconds. Then onto your stomach - hold for 10. Finally, roll onto your left side and hold for 10. Continue that pattern (back, right, stomach, left) for 1 minute. Standing Crossover Crunches (no equipment) - stand with your hands behind your head, fingers behind your ears, elbows out. Bring your opposite elbow to meet your opposite knee, using your abdominals to "crunch". Alternate between sides as quickly as you can (like you're marching in place), keeping your chest up the entire time. That's it for your workout! I'd recommend stretching for 5 minute or so after this one, too, especially since this is a longer total body workout. I hope you enjoy it... and feel the burn afterwards! Readers: chat with me! Do you do cardio and strength intervals during your workouts? How do you like them? 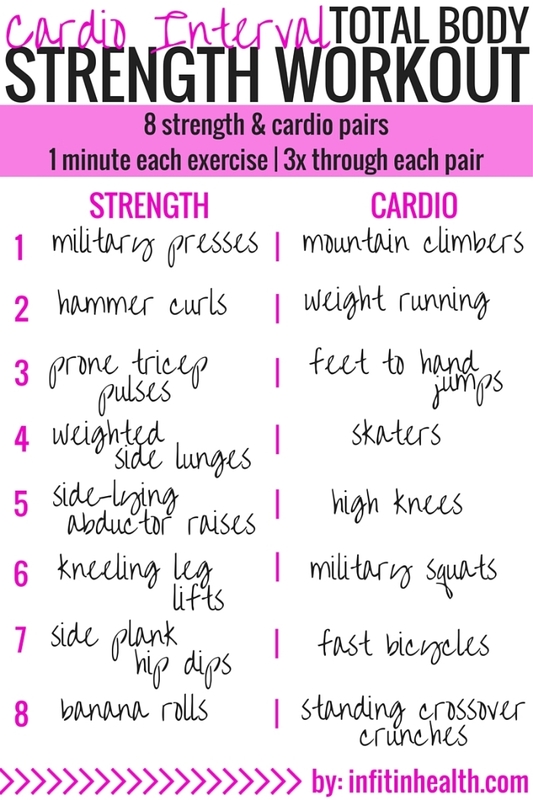 What's your favorite cardio & strength combo? The Wednesday Warmup workout is back this week! Sorry it took a hiatus for a while there. I don't know about you, but lately I've been having trouble getting up out of bed and feeling energized. I'm usually not a morning workout person either, but sometimes a good stretch and a few exercises can jumpstart a good day. That's my hope for this workout today! Keep reading for details of the exercises and what to do. Set your timer for 10 minutes, and complete as many rounds as possible. Tricep Push Ups (Strength - Arms) - lie on your side, with your bottom arm crossed over your chest, and top arm over it with the hand placed on the floor. Use that arm to push your upper body off the floor. Do 25 on one arm, then switch. Jumping Jacks (Cardio) - you know these. :) Trainer Tip: If you have trouble with lateral (side to side) movements causing knee pain, do another cardio-based exercises here like jogging in place, high knees, etc. Squat/Pulse (Strength - Legs/Glutes) - do 5 full squats, keeping your chest up and gaze forward. After 5 full squats, go down halfway and pulse the legs in that position for 5 reps. Repeat that sequence 3 times for a total of 15 each. Elbow-to-Knee Marches (Cardio) - stand with feet hip-width apart, hands behind head, elbows out. Quickly march in place touching the opposite elbow to opposite knee. Alternate sides as quick as you can for 40 reps, making sure to stay upright as much as possible. Trainer Tip: bring your knee up to meet your elbow while still standing instead of bending at the waist to bring the two together. Bicycle Knee Presses (Strength - Core) - similar to regular bicycles, but instead of bringing your elbow to meet your knee, take your hand and press into your knee engaging your abdominal muscles more. Hold the press for a second or two, and then do the same thing on the other side. Alternate that pattern quickly for 20 reps.
Mountain Climbers (Cardio) - start standing, and bend down, placing your hands on the floor. Jump back into a plank. From here, alternate "running" your legs in this plank position (bringing your knees into your chest quickly) for 10. Then reverse the move, jumping your feet back up to your hands, and standing/jumping up. That's 1 rep. Continue that for 5 reps total. That's your warmup for this Wednesday - let me know how it goes! And, as always, happy mid-week everyone! How are you spending your Wednesday? What are you looking forward to today?